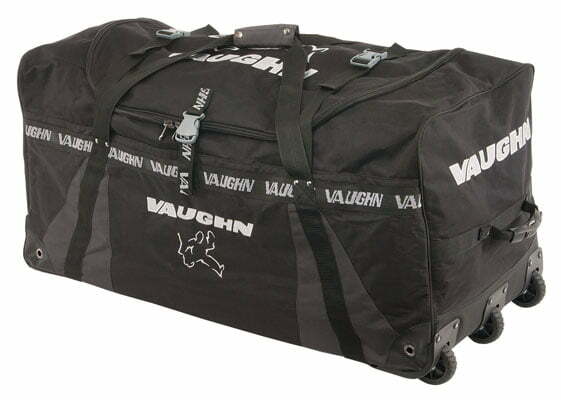 Vaughn Hockey Senior Goalie Wheel Bag | Sports Etc. The XR Pro goal bag from Vaughn is designed to hold a complete set of adult size goal equipment. The bag is constructed with a durable high strength 1680 denier nylon and reinforced with rip stop nylon in critical high stress areas. Carry straps are box stitched and reinforced for added strength. Three wheel design has large size wheels that help keep the bag from dragging on the bottom edge when heavily loaded. Internal storage pockets with zippers on each side and one end for added storage inside the bag. Wide U shaped opening for easy access and added straps across the top of the bag can be adjusted to keep the equipment from shifting and keeps the equipment centered in the bag for easier pulling or carrying of the bag. One of the premier goalie bags on the market.